Ellyn Zinsmeister began creating at a very early age. She quickly went from sorting buttons on the floor of her mom's sewing room to stitching pillows, bright colored halter tops, stuffed cows (don’t ask), and homecoming dresses. During her college years she worked in a fabric store and her stash began to grow. Along the way she tried many crafts, counted cross stitch, painted wood shapes, even basket weaving, but always returned to fabric, her first love. After a brief stint pretending to be an accountant (who was she kidding?) Ellyn began sewing baby clothes for the three adorable children she created with her husband, Rick. Nowadays she provides her grown up kids with an endless supply of pillows, aprons, patchwork towels and blankets. Eventually her mom convinced her to give quilting a try. Many quilts later, Ellyn is hooked! 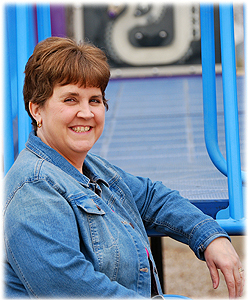 A lover of journalling her whole life, Ellyn embraced the blogging craze in 2008 and ellyn’s place was born. What began as a place to record her creative journey quickly became the door to a community of bloggers that Ellyn had never imagined existed. She loves getting to know other bloggers, sharing ideas and swapping packages in the mail. Ellyn has self published several bag patterns and continues to develop new ideas. She spends time in her happy craft studio nearly every day. In addition to sewing and quilting, she loves to crochet, embroider and sing in the church choir. Teaching young friends to sew has recently brought her great joy. In addition to her awesome family and friends, Ellyn is thankful for Pandora radio, polka dots, teapots, aprons and birdhouses.